"Over the years, Peppers and Rogers have given me valuable advice about navigating the changing business landscape. This book is a must-read for managers who want to empower their employees and customers to?make change their ally." "In a time when most companies are built to flip, Peppers and Rogers have planted a stake in the ground to help you survive past the next round of financing or consumer fad. 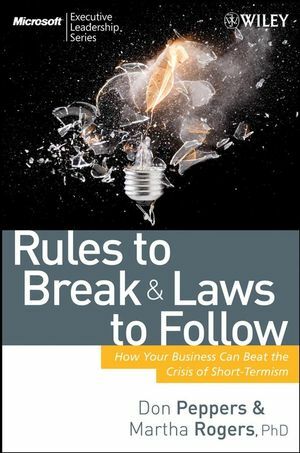 Knowing what rules to break is arguably even more important than what laws to follow, and this book imparts knowledge for both." "Peppers and Rogers have created the unthinkable: an enjoyable wake-up call! Their book serves up one compelling and provocative idea after another, and the authors enjoy debunking some of our most deeply ingrained business beliefs. Read this book and your customers will thank you." Don Peppers & Martha Rogers, PhD, are the founding partners of Peppers & Rogers Group and 1to1 Media, the world's premier customer-focused consultancy and award-winning publishing company, now part of Carlson Marketing Worldwide. In addition to hundreds of trade and academic articles appearing in publications including Harvard Business Review, they are the coauthors of the bestselling "1to1" series of business books, available in seventeen languages. In addition, they have written a comprehensive graduate-level textbook, Managing Customer Relationships. Their most recent book was the highly successful Return on Customer, challenging companies to measure business success entirely differently, and documenting the customer base as a revenue-producing asset for businesses, capable of driving a company's long-term economic worth. Peppers and Rogers have been cited on numerous lists of thought leaders and business gurus, and serve on several boards.